This is located on northbound Franklin Street, north of 17th Street (in front of UPS, Le Magic Cleaners, Beauty's Bagels). There is always double parking on top of the bike lane. This is unacceptable!!! Keep this bike lane unobstructed or make the bike lane protected! Biking here is very unsafe because of the double parking, forcing bicyclists into high speed vehicle traffic lanes. More yellow and green zones for the adjacent businesses. Cars sometimes extend into the crosswalk too! OAK 311 has received this issue. Your service request ID is #897421. Please check back for status updates, or contact us directly at 510-615-5566. Over 15 Lime electric kick scooters are spilled all over the sidewalk and blocking pedestrian path of travel. It is blocking multiple curb ramps and obstructing accessibility. Located at the west corner of the Broadway & 20th Street on 4/20/19. OAK 311 has received this issue. Your service request ID is #897356. Please check back for status updates, or contact us directly at 510-615-5566. This report contains the wrong address. The utility boxes in front of 2104 Broadway, parcel #8-650-7-1, are badly damaged with the re-bar showing and open spaces large enough to cause severe injury. This is not an issue of tree roots. This is a maintenance issue. OAK 311 has received this issue. Your service request ID is #897179. Please check back for status updates, or contact us directly at 510-615-5566. OAK 311 has received this issue. Your service request ID is #896949. 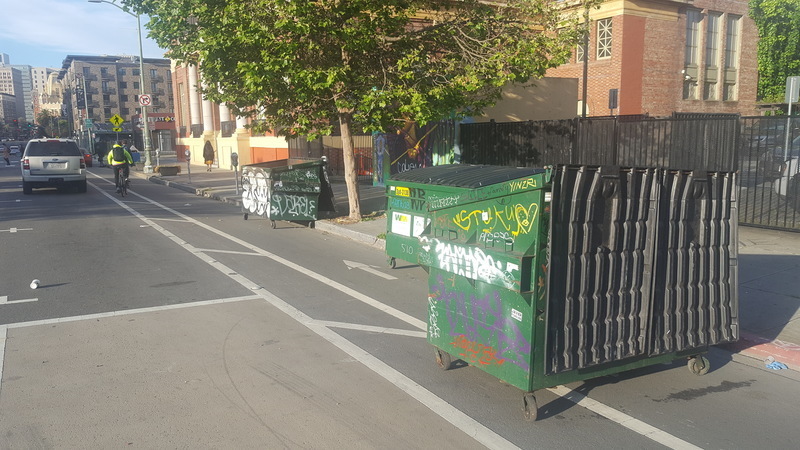 Please check back for status updates, or contact us directly at 510-615-5566.
commercial dumpsters. bike lanes. every. single. OAK 311 has received this issue. Your service request ID is #896856. Please check back for status updates, or contact us directly at 510-615-5566. Located at 2225 Webster. Please forward to pacific gas and electric representative. OAK 311 has received this issue. Your service request ID is #896909. Please check back for status updates, or contact us directly at 510-615-5566. Located at uptown pediatric dentist office. A pacific telephone man hole is crumbling. OAK 311 has received this issue. Your service request ID is #896902. Please check back for status updates, or contact us directly at 510-615-5566. New traffic signal at Harrison/22nd does not provide a walk signal with a green light on the south side of the intersection. This conflicts with Oakland's Pedestrian Signal Policy that states pedestrians should not have to push a button to cross a street downtown and along streets with high volumes of pedestrians. OAK 311 has received this issue. Your service request ID is #896777. Please check back for status updates, or contact us directly at 510-615-5566. New traffic signal at Harrison/Lakeside does not provide a walk signal with a green light. This conflicts with Oakland's Pedestrian Signal Policy that states pedestrians should not have to push a button to cross a street downtown and along streets with high volumes of pedestrians. OAK 311 has received this issue. Your service request ID is #896776. Please check back for status updates, or contact us directly at 510-615-5566. Please contact the PWD call center 615-5566 or 311 for all dangerous or hazardous issues. Pedestrian traffic signal issues count as both.